Candy: good. Ice cream: good. Combining the two: freaking awesome! For the third year, Baskin-Robbins has created a line of limited edition candy bar-inspired flavors and creations to add to their already substantial lineup. 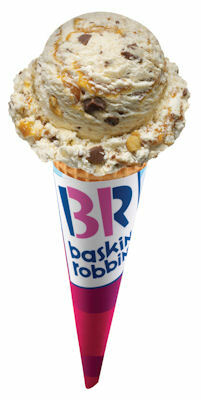 Through May 3, 2009 you can enjoy two of your favorite candies, Snickers and M&M’s, combined with ice cream at Baskin-Robbins. From sundaes to shakes and cakes, you’re bound to find a combo that tickles your sweet tooth. Check out the website for some of their creations, and be sure to pop down to your local Baskin-Robbins to enjoy the sweet treats! I have many a fond memory of Baskin-Robbins from childhood: the free birthday cones, the baseball helmet sundaes, the hard, hard scoops that could be shot clear off your sugar cone and onto the lawn with one overzealous lick. Not to mention the choices â€“ oh, the choices! All 31-plus of them! And I reveled in my flavor selection: Rocky Road, Rainbow Sherbet, Cookies â€˜N Creamâ€¦ the world was my hot fudge-covered oyster (notably not one of the aforementioned 31-plus). 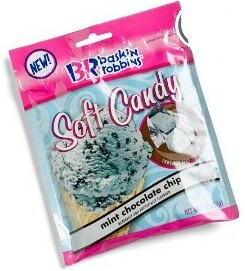 But I have to admit, in all my ice cream eating moments, never (ever) did I think to myself, â€œMmmm, this ice cream is good, but it would be really good if only I could chew it.â€ So it is with a bit of skepticism that I opened up my box of Baskin-Robbins Soft Candy. These candies come in two flavors: Mint Chocolate Chip and Very Berry Strawberry, and in both regular and sugar free varieties. Theyâ€™re quite small â€“ smaller than a Tootsie Roll â€“ and rectangular. And theyâ€™re individually wrapped in foil reminiscent of my Viactiv Multi-Vitamin Chew (highly recommended as a vitamin supplement, less so as a sugary treat).